In the rolling hills of the Teign Valley, close to Chudleigh and with Torquay to the south and Dartmoor to the north it is easy to venture out and discover the coastal charms of the English Riviera or the unspoilt beauty of the moors. When it comes to fun, Finlake offers the perfect backdrop for long lazy days with family and friends. Why not drink in the views as you lie back and relax on your decking or relax in the company of friends whilst you BBQ on those long summer evenings. There are a whole range of activities on hand for all the family to sample, choose from horse riding, a fully equipped gym, indoor and outdoor swimming pools, sauna or steam room. Plus you can dive into a huge choice of activities available through the "Go Active" programme including rock climbing, archery, table tennis, snorkelling and many other exciting activities each day! The park’s friendly Retreat bar and restaurant gives you a fabulous choice of fabulous home cooked meals made from locally soured ingredients, plus a fantastic variety of weekend live entertainment. * Outdoor pool and water slide, tennis courts, adventure playground, high ropes, 9 hole approach golf course, course fishing lakes, horse riding, picnic areas. Obscure double glazed entrance door into…. 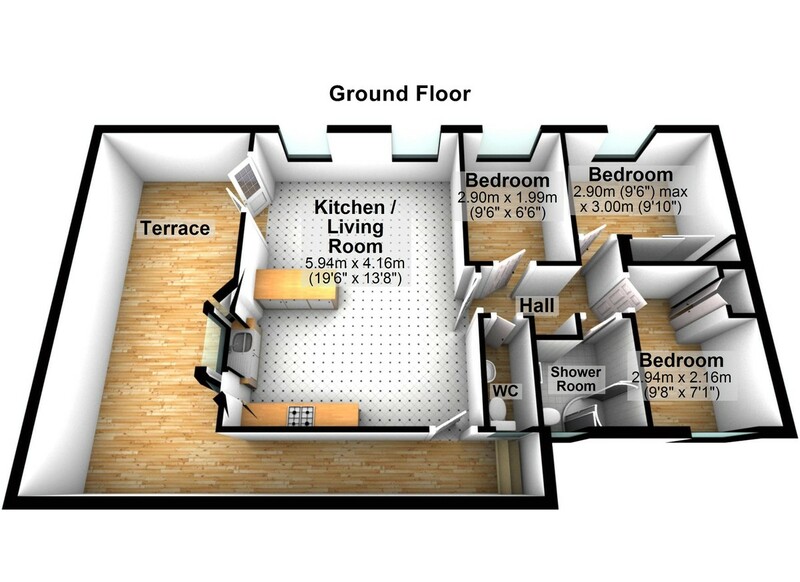 KITCHEN/DINER/LOUNGE 19′ 5" x 13′ 7" (5.94m x 4.16m) Spacious open plan living space that is great for entertaining. Modern fitted gloss kitchen, with grey works tops, gas hob, electric single cooker, extractor hood and double sink with mixer taps. Integrated, fridge freezer, & dishwasher. Ample storage and bay fronted window over looking the deck area. Leading to the dining area, and lounge. Comprising of an electric feature fireplace, wall to ceiling windows, and double patio doors leading on to the deck area and hot tub. A perfect place to bring out doors in. BEDROOM 3 9′ 6" x 6′ 6" (2.9m x 1.99m) Tastefully decorated, good size room with two single beds, storage cupboards, radiator, and upvc double glazed window. BEDROOM 1 9′ 6" x 9′ 10" (2.9m x 3m) Master bedroom with glazed double fronted fitted wardrobes, over head fitted storage cupboards and fitted bedside cabinets, radiator, and upvc double glazed window. BATHROOM Modern airy family shower room, comprising of double door shower unit, chrome mains mixer tap and overhead shower. White sink with chrome mixer taps, vanity unit, wall mounted mirror and white corner WC. Radiator, upvc double glazed window. WC White sink with chrome mixer taps, vanity unit, wall mounted mirror and white corner WC. Radiator, upvc double glazed window. OUTSIDE Outside this wonderful lodge is elevated to gain a wonderful view of the local woodlands and park itself, and can be appreciated from the decked area that wraps itself around two sides of the property. This private area not only gives a feeling of seclusion and tranquility but is also home to the 4 person hot tub, perfect for relaxing and entertaining. The property also benefits from private parking. A superb opportunity to purchase this fantastic holiday lodge in Finlake near Chudleigh. Finlake is situated in 130 acres of woodland and offers state of the art fitness centre, and swimming facilities for your stay. The lodge itself offer excellent accommodation with a large open plan lounge/kitchen/dining room. Three bedrooms, and family bathroom. Outside the property benefits from a private wrap-around balcony with a hot tub and seating area, and parking for two vehicles.